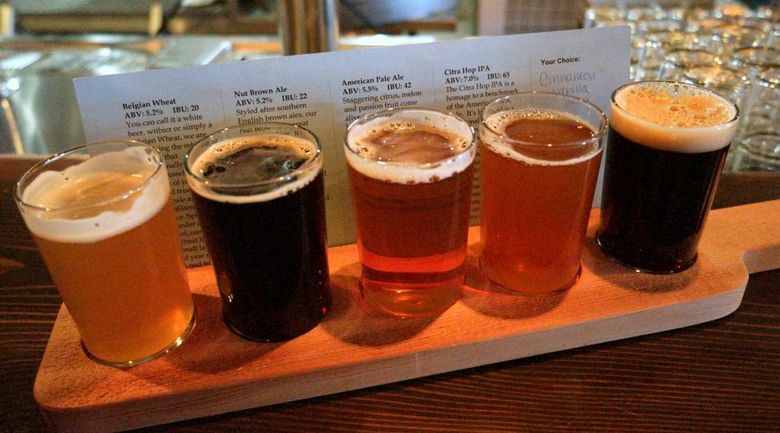 Explore Anacortes Community Forest Lands, then discover year-old Bastion Brewing. 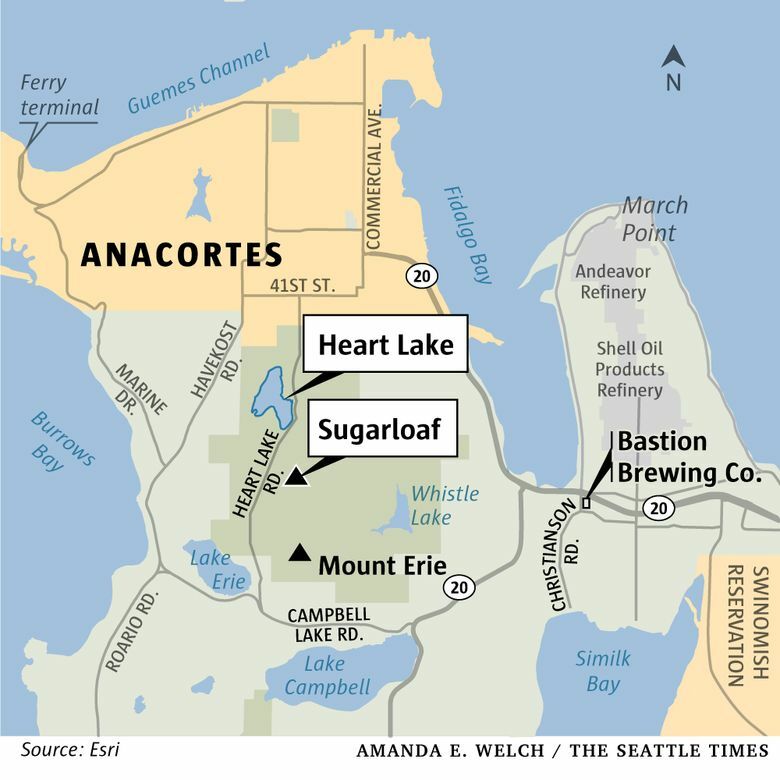 This four-mile loop through Anacortes Community Forest Lands takes you around Heart Lake and up to Sugarloaf View. The first half, a trail that hews close to the lake’s edge, is an undemanding trek, suitable for the most novice of hikers. It’s only in Mile 3 that the going gets a little tougher. As you tackle ever-steepening inclines en route to a splendid glimpse of Skagit Bay and beyond, you’re bound to break a sweat and kick up a little dirt. Still, it’s a relatively simple hike and one that’s great for kids (I encountered a day-camp nature lesson at the summit). 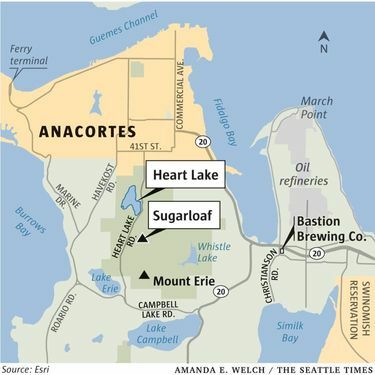 At 1,044 feet, Sugarloaf is lower in elevation than neighboring Mount Erie (elevation 1,273), but Sugarloaf distinguishes itself by being inaccessible by road, making it easier to embrace the natural isolation of the vast Forest Lands, a 2,800-acre mosaic of city-managed woods, wetlands, lakes and meadows with more than 50 miles of multiple-use trails. FACILITIES: A parking lot just off Heart Lake Road can accommodate a couple dozen cars. If that’s full, the lot at the base of Mt. Erie Road is a good alternative. Two vault toilets at the Heart Lake lot, and a boat launch. THE ROUTE: Trails are marked by brown signs denoting the trail number and listing permitted modes of transit. To get started, look for the sign for Trail 210 out of the parking lot and around Heart Lake (not to be confused with Trail 242). Right out of the gate, you’ll spot a quaint, wooden bench at the lake’s edge. It’s a perfect place to stop and snag a photo. I advise against venturing into the water, however. A posted sign tells of an ongoing battle with milfoil, filamentous algae mats, Hornwort and toxic blue-green algae blooms. Per the bulletin, Anacortes Parks & Recreation is working with scientists from Western Washington University and Herrera Environmental Consultants to resolve this ecological headache, but for now it’s probably best to steer clear of Heart Lake’s murky depths. Back on Trail 210, you’ll move through a forest of firs and ferns. It’s enjoyable, and never arduous, though the canopy is thick and the sun reaches the forest floor only now and again. You’ll continue like this for roughly 2 miles until the trail dead-ends at Trail 212. Turn left here until you reach Heart Lake Road, where you’ll cross into the Mt. Erie Road parking lot. On the left, you should see Trail 215, where you’ll launch into the second half of the hike. At the trailhead, a sign cheekily reminds dogs to keep their owners leashed. 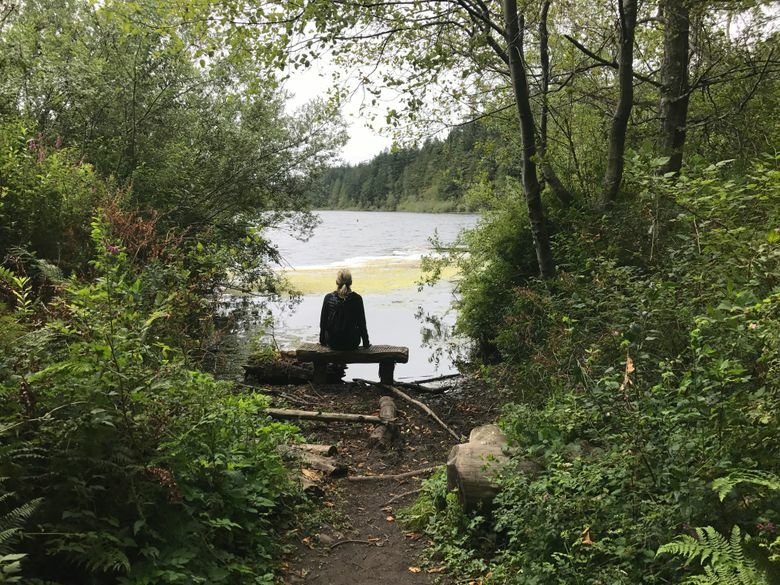 As you climb upward on Trail 215, you’ll start to encounter views of the larger bodies of water beyond Heart Lake (including Skagit Bay) and of the gorgeous forest in which you’ve been trekking. Near the summit, things get confusing. Most trails either dead-end or lead to the top of Sugarloaf, though, so don’t fret about wrong turns. Bear right at the first major junction for the first of Sugarloaf’s two major views (a broad, flat rock). When you’re done catching your breath there, continue on Trail 215 for a brief stretch until you encounter Trail 228. Trail 228 will take you out into a grassy clearing replete with dandelions and, depending on the season, other wildflowers. After that, it’s easy going. At the peak, there’s plenty of space to sit or explore, so if you packed a lunch, this is the place to eat it. To return to your car, look for the unmarked fork at the back of Sugarloaf View and take the leftmost path. This is Trail 226. Follow it until you reach the much wider Trail 21 and, in turn, follow that to Trail 313, which will dump you on Heart Lake Road just across from your car. RESTRICTIONS: Large portions of the trail do not permit motor vehicles, bicycles or horses, so leave Seabiscuit behind. Dogs are allowed in the park, but must be leashed. The park is open 6 a.m.-10 p.m. DIRECTIONS: From Interstate 5 in Skagit County, take Exit 230 for Burlington/Anacortes. Go west on Highway 20 for about 12 miles before following 20 left toward Whidbey Island. Continue about 2 miles before turning right onto Campbell Lake Road. From there, you’ve got another mile until you reach Lake Erie Grocery and Trailer Park where you’ll bear right onto Heart Lake Road. About two miles up the road, Heart Lake is on your left, followed by a pair of opened white gates leading into the gravel lot. 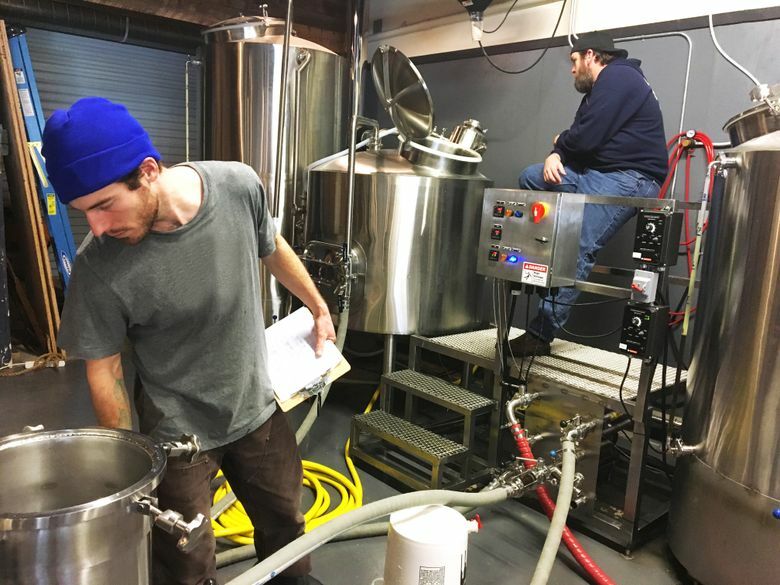 WHAT: Bastion Brewing Co. is an Anacortes microbrewery opened last September by husband and wife Joe Behan and Cristine Plecki. Beers and ciders are brewed on-site in view of the taproom. WHERE: 12529 Christianson Road, Anacortes, on your journey back along Highway 20. WHY: Located across the highway from the oil refineries, Bastion attracts a large and eclectic crowd. When I was there, at 3 p.m. on a Thursday, the bar was fairly packed. Manager Keyla Beebe says this is part of what attracted her to Bastion. “It brings a lot of people together,” Beebe says. I asked what beer she recommends. Right now, she says the hazy IPA is really popular (hazy IPA is having something of a moment). For a refreshing post-hike drink, however, Beebe suggests the pilsner, the Irish Red, or really … anything. “I always say I never play favorites with my beers. They always have their own time and place,” says Beebe. I was looking for something citrusy, so I ordered the Cascadia Sunset Red. 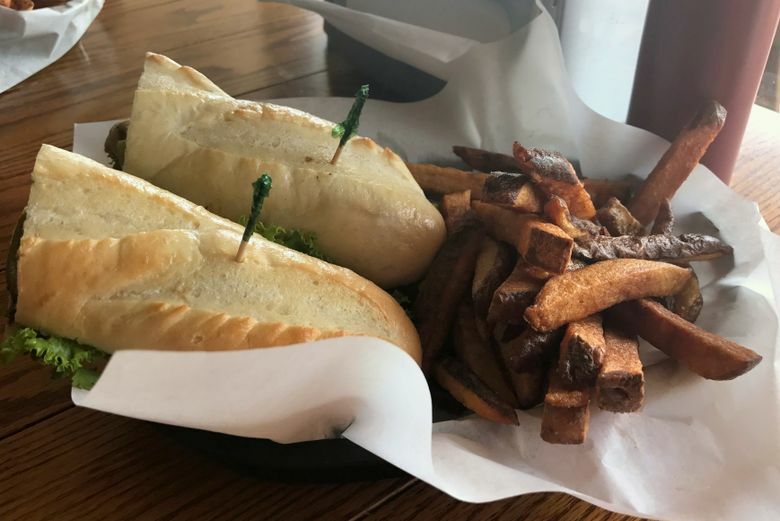 Bastion’s kitchen has a fast-food vibe (it’s located in a separate room from the bar and seating) and it’s pretty apparent that their culinary offerings aren’t exactly their bread and butter. I settled on an oddly-cooked spicy chicken sandwich that was just OK. The fries, however, were exceptional and pair quite nicely with Bastion brews. GOOD TO KNOW: Bastion hosts a summer concert series in its parking lot, featuring local acts through Sept. 16. Find the schedule on its website. Then the fun moves indoors. “In the winter we build the stage actually in the brewery, so we have to break it down so the brewers can actually get to work on Monday,” laughs Beebe. There’s trivia on Wednesdays at 6 p.m. and Happy Hour 4-7 p.m. daily. WHEN: Sunday-Thursday, 11:30 a.m.-9 p.m.; Friday-Saturday, 11:30 a.m.-10 p.m.